From the start, we’ve always been focused on hand-built American cars. While mostly defined by the “sports car” genre, we’ve been intrigued by other hand-built cars, trucks, transporters and more. 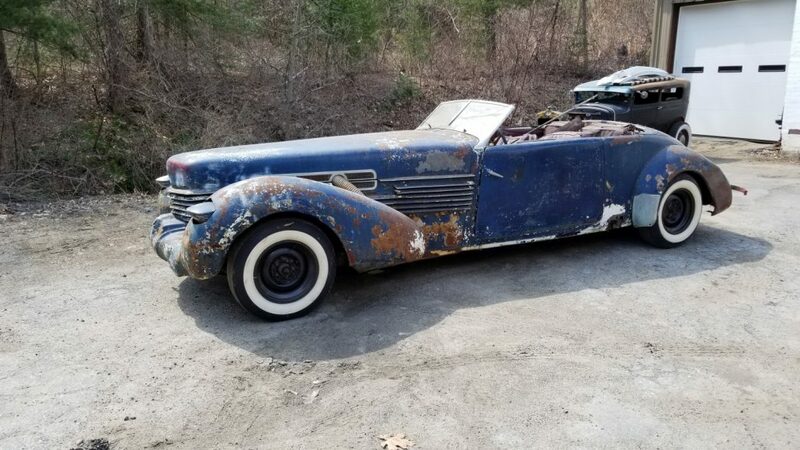 So when we came across a craigslist ad about two years ago for a “long-wheelbase” Cord Phaeton, we were intrigued to learn more. But as I always say….be careful what you research – and what you wish for. 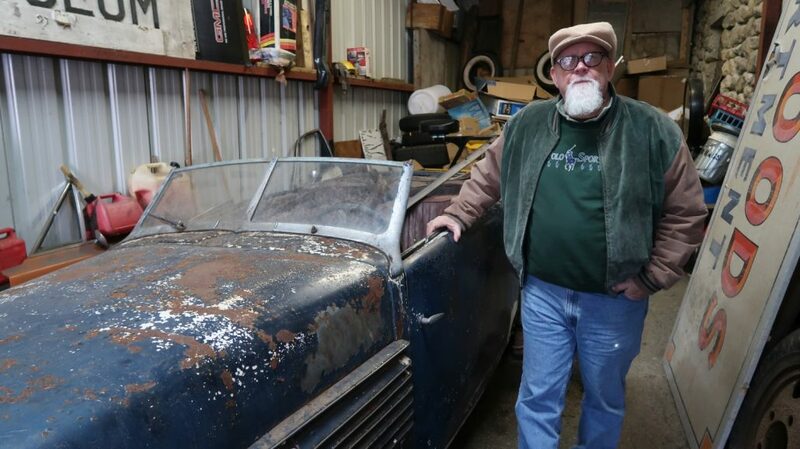 It’s interesting researching handbuilt postwar sports cars – and they didn’t suddenly “appear.” Just after World War II ended, there was great interest in creating something small and sporty in line with some of the European sports cars seen both pre and early postwar times. Sometimes “sport customs” were created using an original body design and other times they were created from existing cars and modified in stylish ways. The Pebble Beach Concours d’Elegance showcased a class of these sports customs on their field in August, 2012. Click here to learn more. 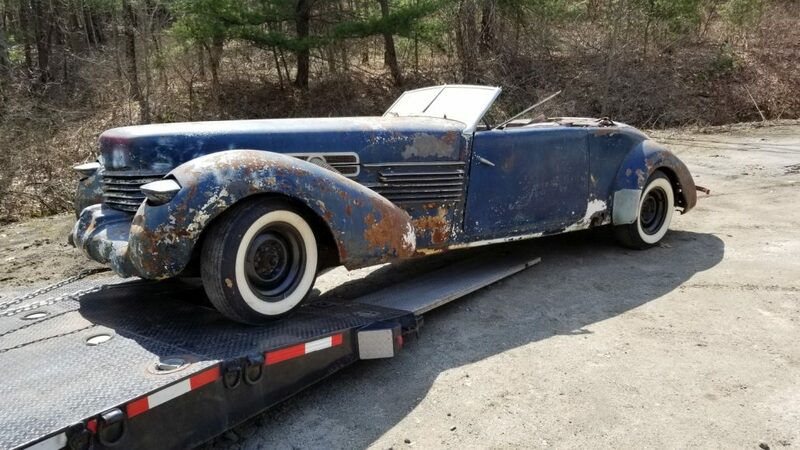 And it was in those early postwar “sport custom” years that it appears that this long-wheelbase Cord may have been created. In reviewing magazines from the 1950s, several Cord 810 and 812 models were modified and built by creative and talented artisans across America. 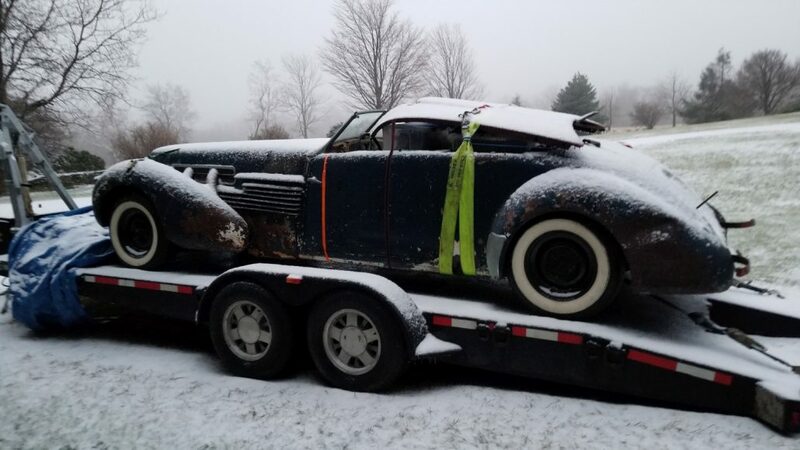 Some changed out just the drivetrain making the Cord a rear-wheel drive car – and that’s not as easy as it sounds. 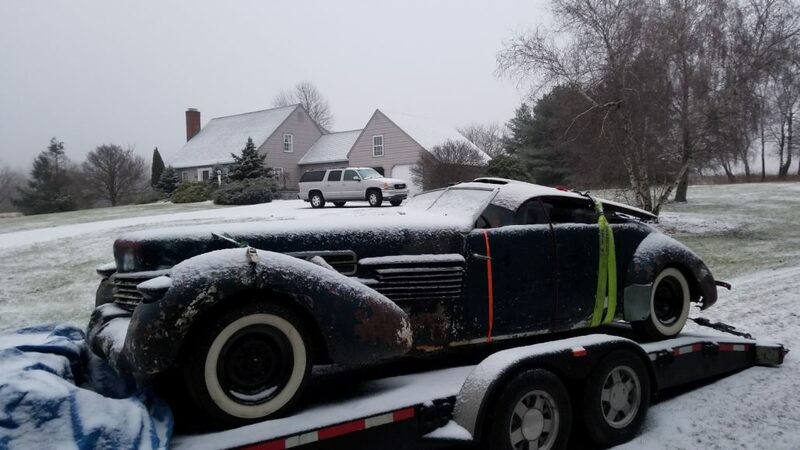 The Cord was a front wheel drive car with unibody and subframe construction. This means that the body itself had to be modified to either accept a rear-wheel drive configuration or a different frame would have to be fitted to the body. In either event, not an easy task to do. Several modified Cords were built some on different chassis, others with modified bodies and some using just the Cord drivetrain. 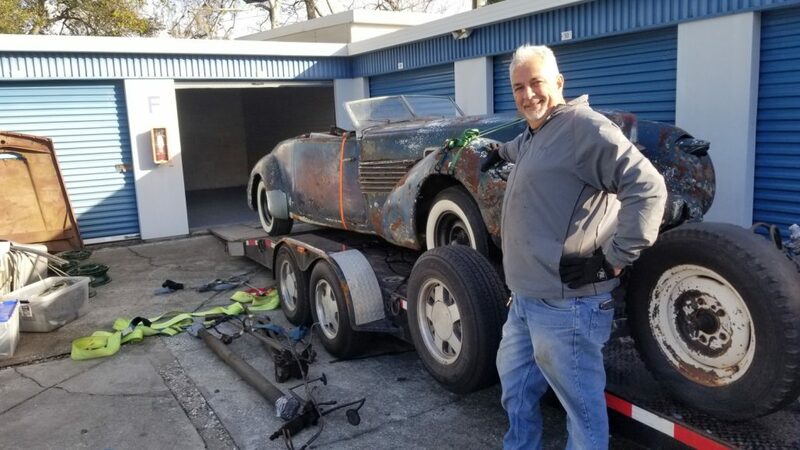 It was an interesting and creative time in building and customizing your own car and we’ll feature some of the vintage photos and stories of these modified Cords in the future. 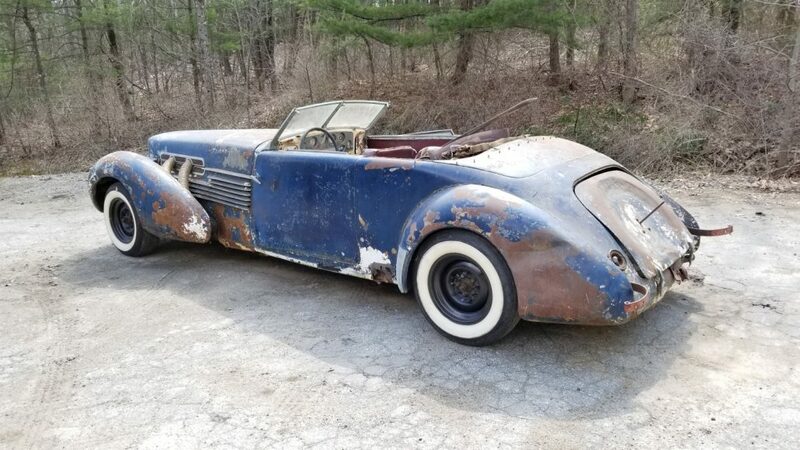 From what we know now, the modified Cord Phaeton we found is one of the few surviving postwar modified Cords with research still to follow. An exciting find indeed. 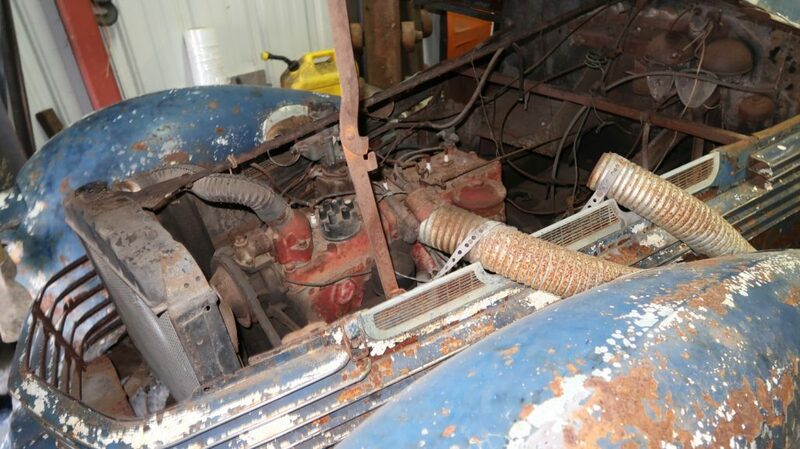 The engine and chassis used appear to be from a Chrysler product. 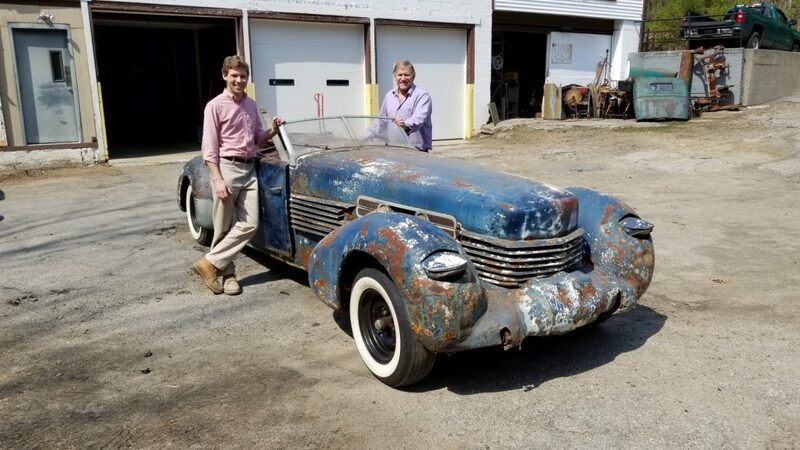 So Craig Johnson and I headed out to check out the Cord on one of our visits in late 2017, and boy was that car long! 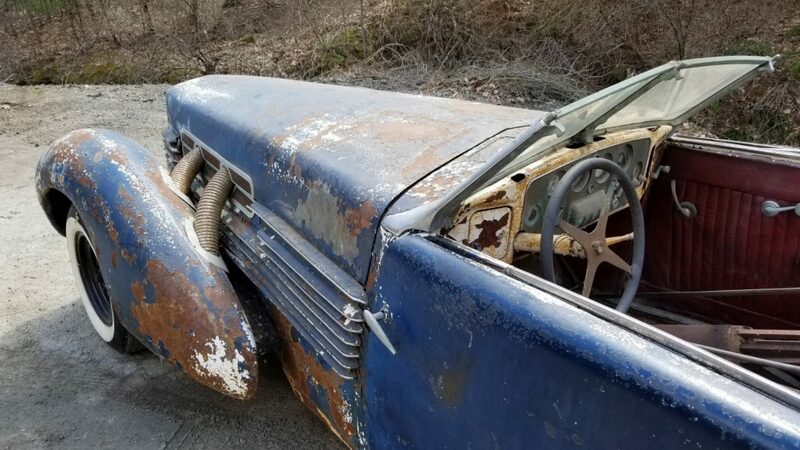 All modifications to length appear to have been forward of the windshield and the Cord was fitted to a Chrysler frame of unknown vintage. 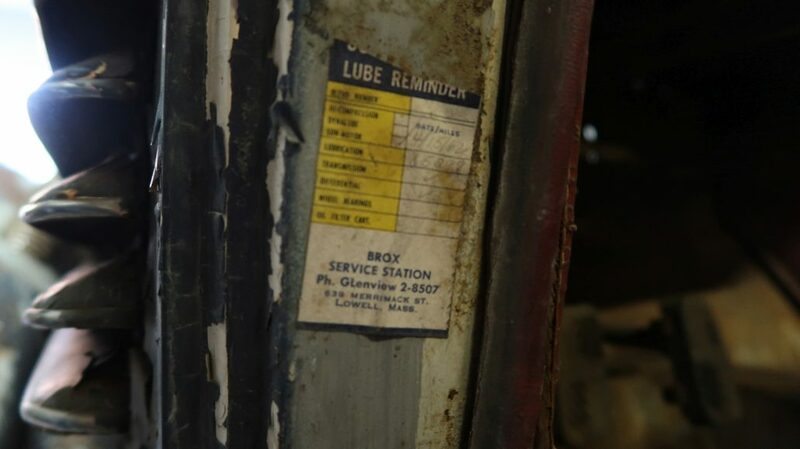 The only date we could find on the car was an oil change sticker from 1962 in Lowell, Massachusetts. Not a lot to go on, but research is never easy and at least we had a place to start. 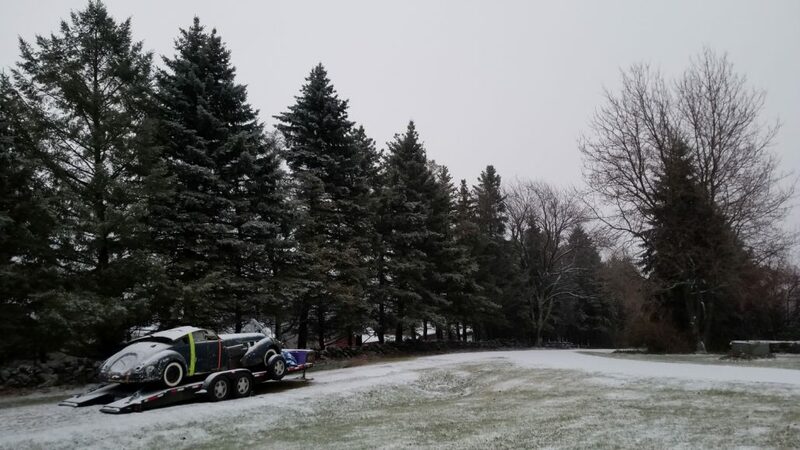 We waited out the winter and by April, 2018 we had made our way back to New England and arranged to pick up the car. Friends from Connecticut accompanied us this time – Pete and Nick Bujnowski – and were there to help load, transport and store the Cord for us for a bit. All went well, we transported the Cord back to their home in western Connecticut, and parked until later when we could pick it up. Great thanks to Nick (left) and Pete Bujnowski (right) for their help in retrieving and storing the Cord in 2018. 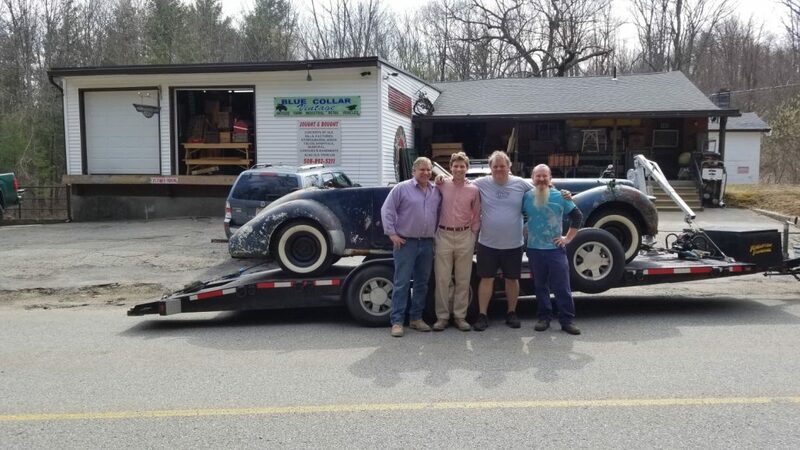 Our travels brought us back to Connecticut with an empty trailer in late 2018 and we made arrangements to bring the Cord home – just in the nick of time. While we were staying in Connecticut for a few days, the weather turned from “nice” to “winter” in an instant. Florida weather is so much more predictable – Connecticut weather not as much. So we waited a few days for the weather to clear and headed home. We arrived home in just before Christmas in 2018 and with the help of more friends off-loaded the Cord and put it into storage. But what did we find and acquire? That’s for the next part of this story. In the meantime, check out some of the additional photos we posted below. 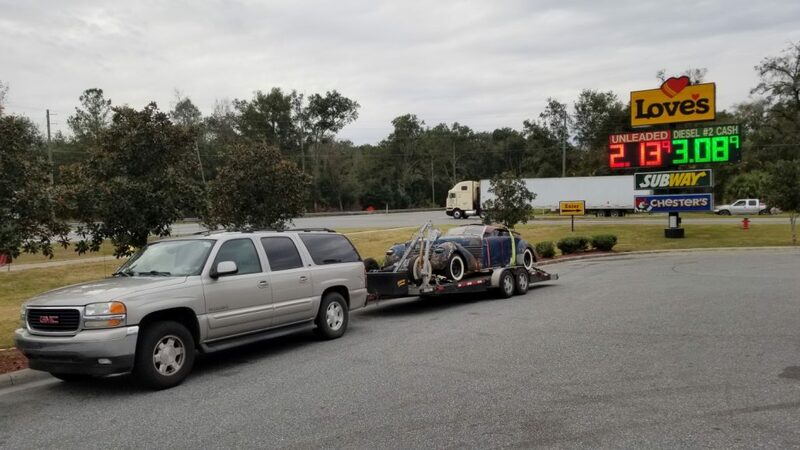 We mocked up some “fun” photos showing Pete’s Corvette and then Nick’s sporty Porsche towing the trailer with the Cord. 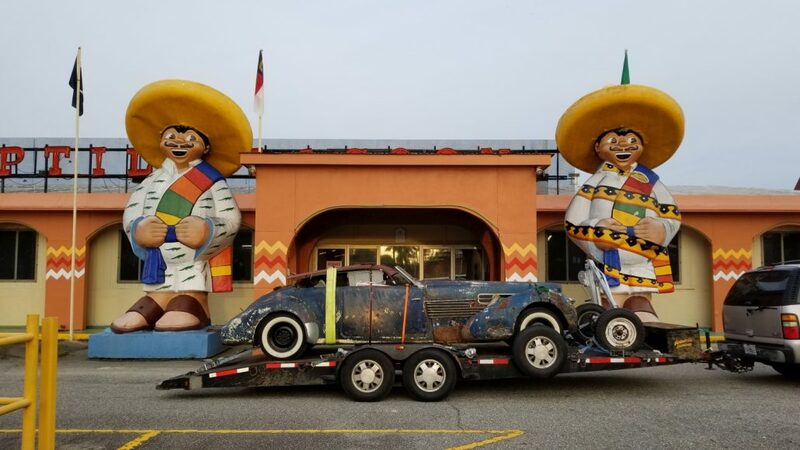 Who can avoid stopping at “South of the Border” on the border of South/North Carolina. Great fun and good food. 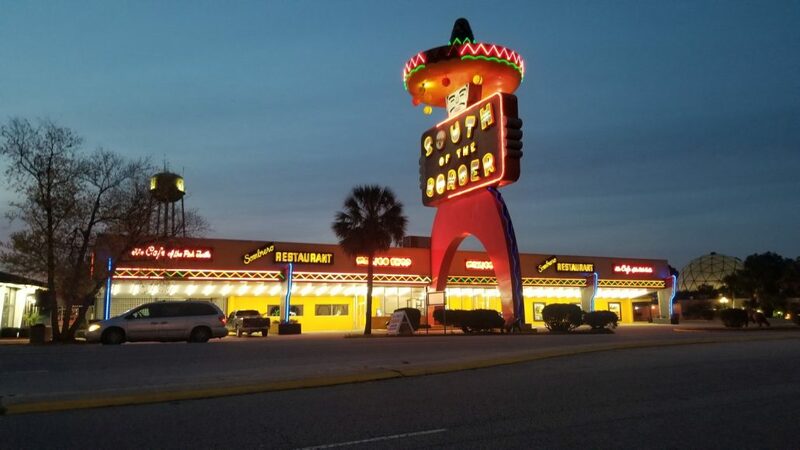 It’s like a stop on a trip that goes back decades on a family trip to Florida. What a fascinating car! The Chrysler chassis , exaggerated length intriqes me. If the frame is uncut or welded together it must be a chrysler or Imperial limo . 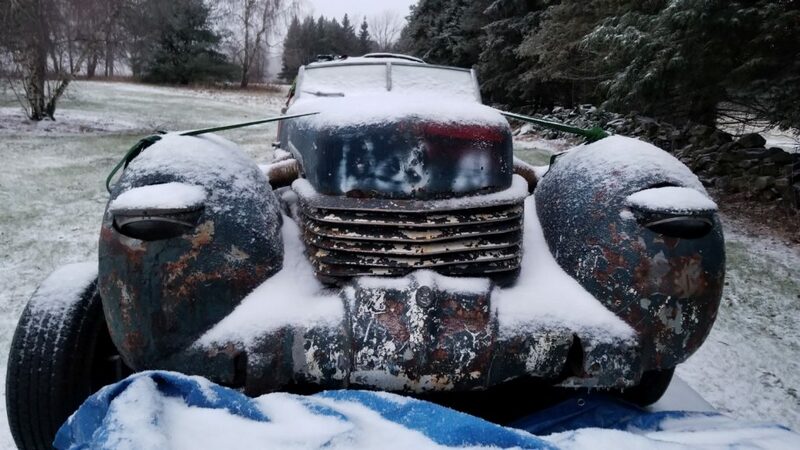 The forties Chrysler’s were 139″ WB , Imperials were 145 thru ’50 ( last year of a flathead 8) If You can find an engine number ,I might be able to identify the year? 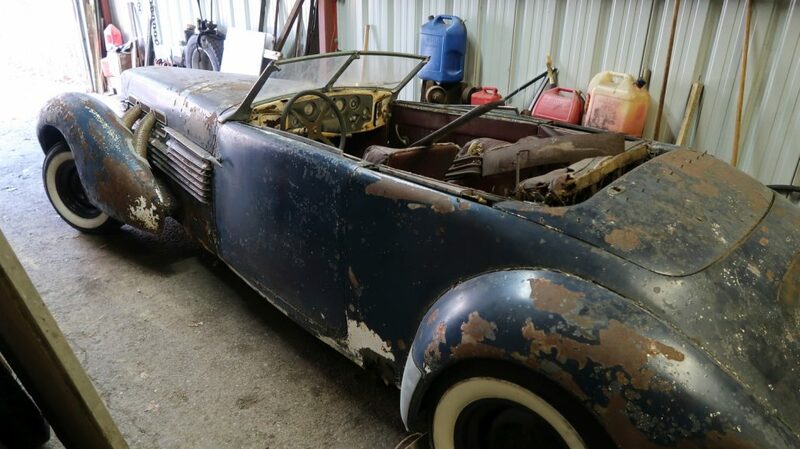 Wether or not You nail down the specifics , it’s going to be a captivating car restored ! Btw , having lived smack in the middle of the 1-95 corridor most of my life, I tottaly relate to Your stories of chasing cars all up and down it . Really enjoy your personal perspective of these interesting “hunts” ! 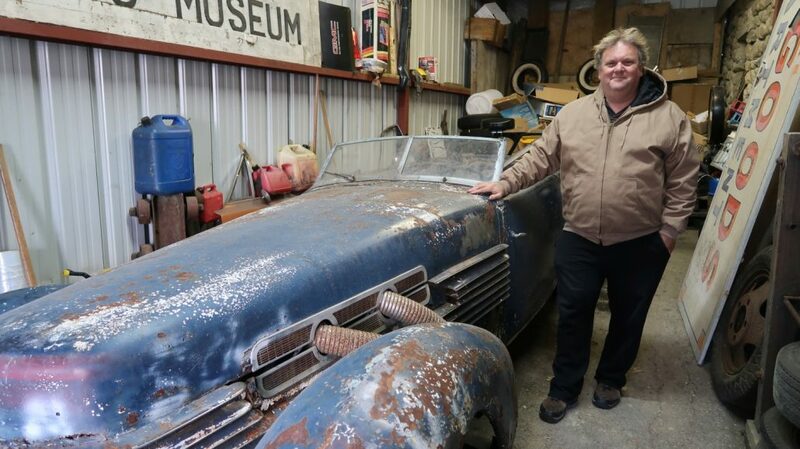 I found a barn full of fiberglass bodied cars in Iowa. 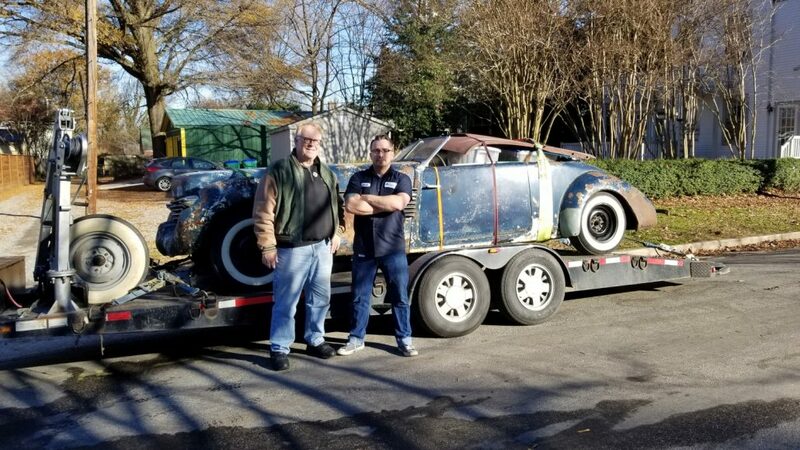 I shared this information with Tom C. The next time you schedule a trip this way…..
La Dawri coupe with a 1960-ish corvette chassis, I then fabricated a Porsche 911 mid engine design, wow could she handle the curves. I have a 60s La Dawri conv obtained in late 60s. It has 51 HJ frame and drive train That I completely rebuilt over the years. I drive it to weekly gatherings in Eustis Fl area. It is a great attention getter. I wonder what happened to the Cord engine and chassis? Next time you’re up North on 95, stop in Hamilton, VA.
Would you add my designer/customizer friend to your list, Ralph Alley? Geoff, you are in a fascinating part of the Hobby. Very interesting find regarding the Cord. Best of luck with it and it seems to have the potential of being stunning if restored.